We’ve got another reason to celebrate the newest addition to our NBC 7 Weather tools. 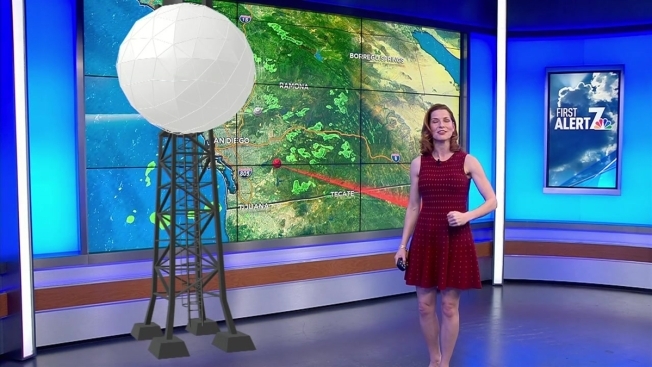 NBC 7's exclusive First Alert 7 Doppler will be the only San Diego County-based radar for the next several weeks as the NWS Doppler radar undergoes a much-needed makeover. Only NBC 7 has a fixed radar to serve our communities from coast to cactus. The radar is based on Mount Miguel and will be up and running 24/7, as usual, to bring you the latest updates during this wet-weather pattern. Check out the current view from First Alert 7 Doppler below. Our First Alert 7 doppler sweeps the region faster and provides higher resolution to offer the most accurate image of where rain may be moving into your neighborhood. First Alert 7 Doppler radar is only on NBC 7.